I apologize for missing my posting times last weekend and the weekend before-- I was traveling. I thought that I would be able to get internet access at some point during that time, but it didn't turn out that way. Back home now, back to my own keyboard! Yay! I also thought that I would get a lot of stitching time while I was traveling. It didn't work out that way either! Ack. My mind has been on other things. My bunny, dear companion for the past six years, got diagnosed with bone cancer. Trying to coordinate his treatment plan with my vet (who was boarding him for me, thank goodness!) while I was traveling was an interesting experience. So now we're hoping for the best, monitoring his day-to-day status, and preparing for the eventual (but hopefully later, not sooner). I finished the bullion bumblebee on Shelly's RR block. I gave him irridescent tatted wings. :) They turned out really great! 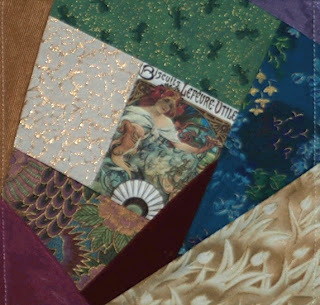 A lot of metallic and shimmer threads are very difficult to tat with because either they are too thin and/or fragile, or because they are shimmer wrapped around a core and the loop-closing process shreds the threads. This irridescent was, I believe, one of the Kreinik braided threads sold for embroidery. It works suprisingly well! I forgot to take my own picture before putting it into the mail. Fortunately, Melody took this delightful picture, so I have something for my records and to share! I actually thought that I had forgotten to write the address on the back of the postcard, so I am absolutely delighted that it even got where it was supposed to! There's a little bit of everything in this one-- crossed chain, u&d buttonhole, herringbone, some tatting, whipped wheel on pistil stitch spokes, and finally some cast-on stitches! 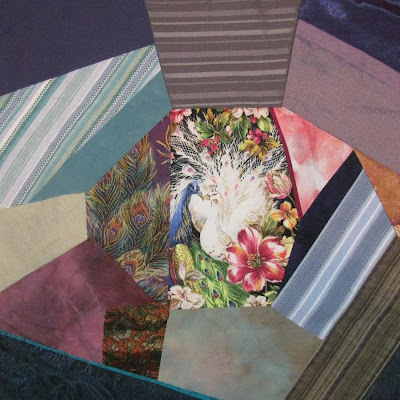 Several of the fabricss I used for this one came from my grandmother's scrap-and-quilt stash. Let's just say that my grandmother and I have very different color sensibilities! She seems to have loved yellowish browns, acid greens, oranges, and all of those colors put together. The 1970s were kind to her, I think! It was a bit of a challenge working in this colorway for me, and I'm not sure how I feel about the red and blue as accents against the orange and green. hmm. This one was especially interesting to stitch on this week because I did the finishing work (backing and binding) before I traveled, and before I did most of the stitching. Fortunately, I'm a fan of the scoop method, so it worked out pretty well for me. 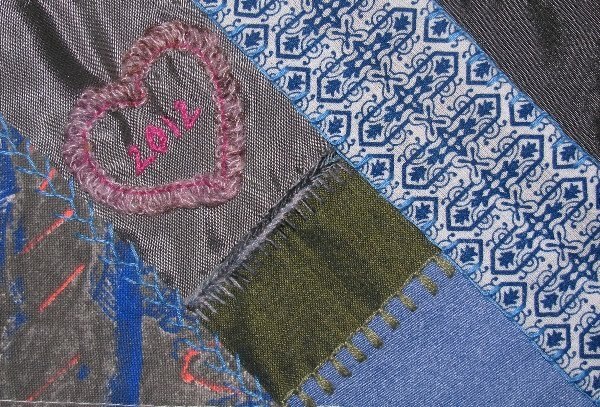 The background fabric is a handwoven leftover from a university project back in 2003. Since my collection of threads was pared down for travel, I opted for a simple triad of red, yellow, and blue for the colorway, and relied upon the stitches for textural interest. There is a rose made of cast-on stitches, a tatted flower made with a modified tatting technique that I worked out while travelling, a crocheted daisy tacked on with a star center, and a whole bunch of French knots. This one and the postcard were still raw-edged, so I had to pick up some background fabric on the go, and do the finishing work by hand. I guess that's where September went! When I get a chance to look at the pictures as I'm typing about them, I realize that I did a lot more stitching than I give myself credit for. Especially when you consider the handwork that doesn't really show (like stitching the border around the pc and the atc by hand). 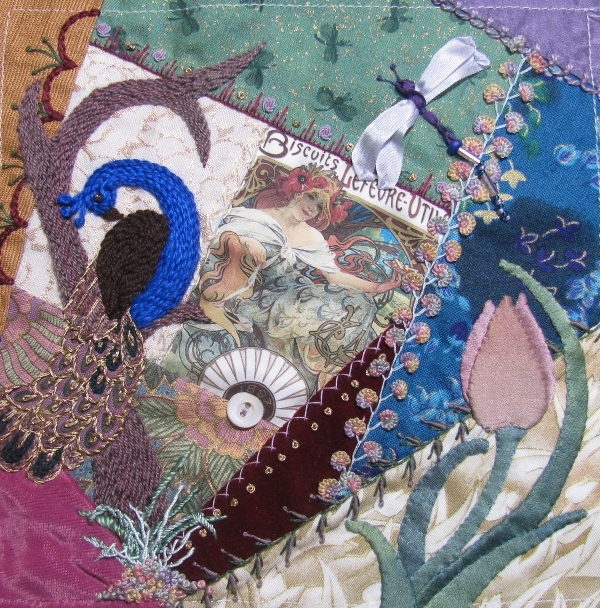 I did get a wee bit done on my peacock CQJP, but am still very far behind, and unlikely to get much finished in the next two days. I played a bit with a couple of knotted Basque stitch variations. They were more interesting to do than to look at, I think. I did some more tatting and added it to the block. Tatting turns out to be a pretty easy thing to do on an airplane. It's small and it doesn't take large arm movements (that might annoy the stranger sharing the armrest), so that's what I did instead of stitching during the flight. I created this unique little combo-stitch that I like quite a lot! 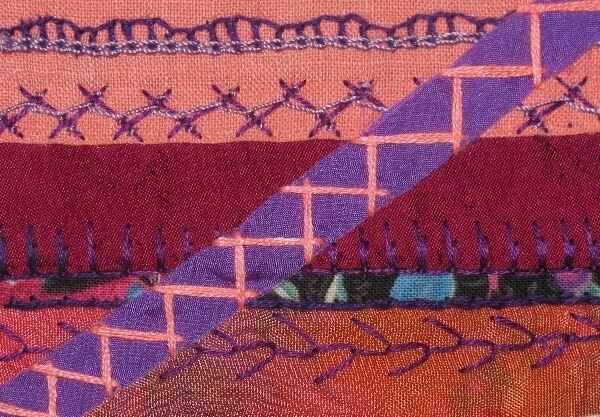 It's a fern stitch of four legs spaced very close together, anchored by a pistil stitch. I think it looks like little chicken footprints. A very odd, alien chicken, maybe. I think it would be very nice with a bugle bead or a seed-bead combo on the long float of the pistil stitch. :) Must try that out now that I am back home with access to my beads again! 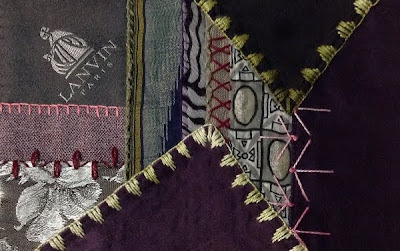 I started with a base of fern stitch in metallic purple. Then I remembered that I still wanted to do a decent exploration of cast-on stitch. 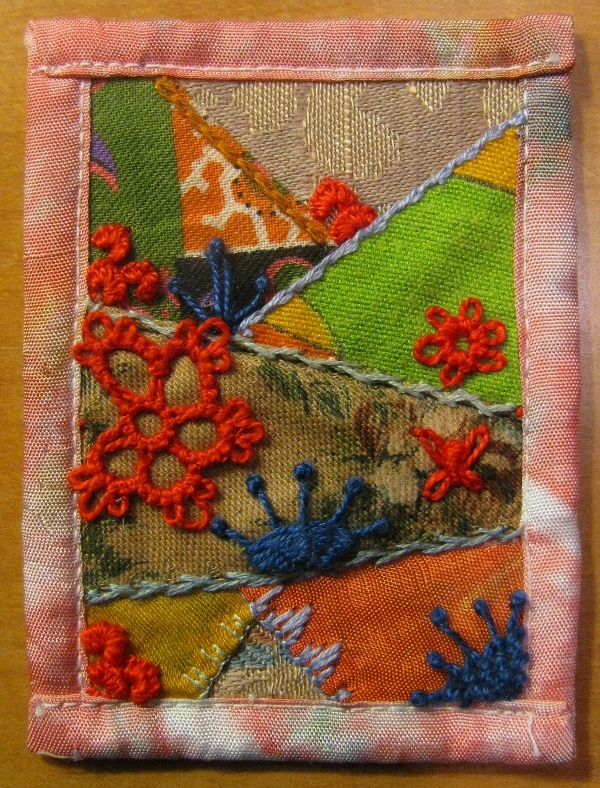 I added a row of fuschia cast-ons, and then came back and added a row of smaller orange cast-ons to overlap them. So cool! I really liked how that turned out. As if that wasn't bright enough already, I added the bright yellow pistil stitch accents. Well, that's what happened to September. Wow! Is it nearly the middle of September already? I can almost feel the weather changing! Soon it will be cold and windy and wet here in the Pacific Northwest. I'd better soak up the last of the sun before it hides for the winter! This is Shelly's block from the Crazy Quilting International round robin swap. I'm the first person to work on this block, so it was naked when I got it. 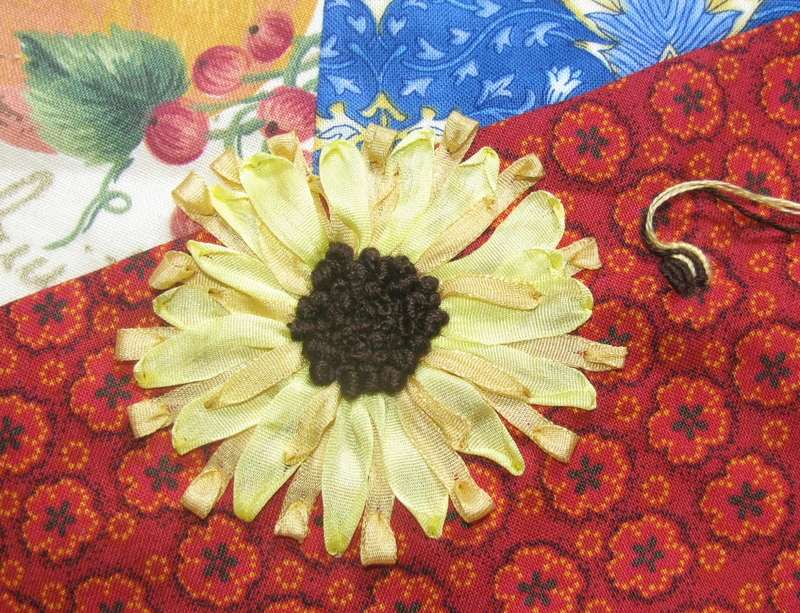 All embroidery and embellishment came out of my needle. Whee! It's kinda hard to be the first person to work on someone else's block: I have to set the mood for the block and I need to remember to leave a fair amount of space for everyone else to work, but not slack on my own share in the doing so! There are three more people who will stitch on this block, so I'm just about done with my share, I think. I wasn't entirely sure what to do with this block at first. I enjoy working with prints, so that wasn't the issue, but the color scheme is one that I don't work with very often, and I'm not entirely sure I understand the aesthetic of "Country French" which is what Shelly hopes for. 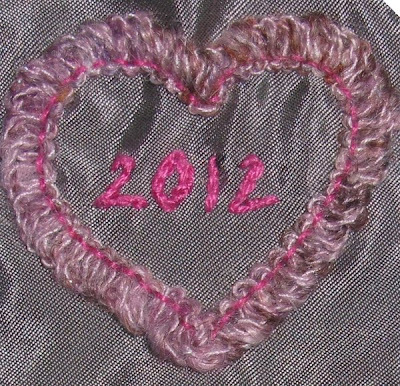 The first thing I stitched on the block, just to get it going, was the little blue line at the bottom left hand corner. The stitch I used reminds me of Fleur d'Lis, so I thought it would be a good choice! 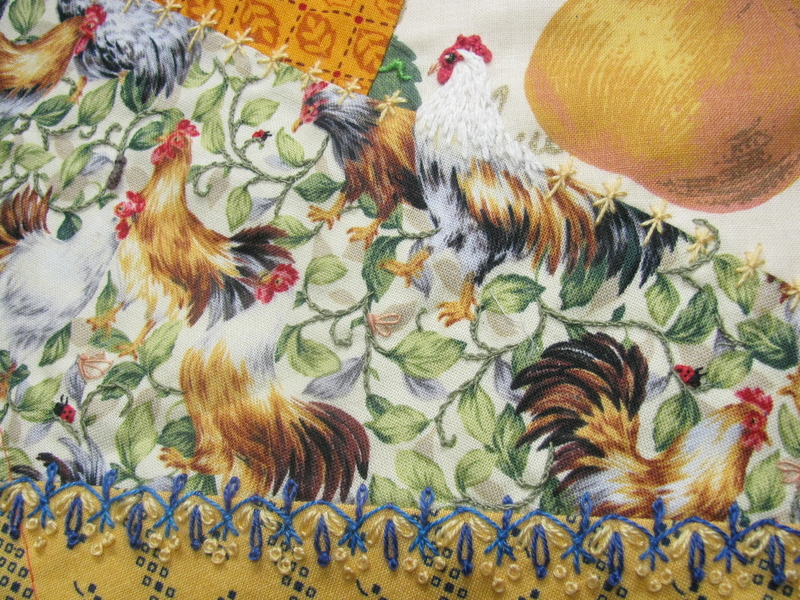 By the time I'd finished the foundation of that first seam (it expanded with additional blue detatched chain and yellow detatched chain and French knots later), I knew that what I *really* wanted to do was enhance the vine pattern on the chicken print fabric. Isn't it precious? I used a silk thread and a wrapped stem stitch to outline all the vine curls. It barely shows, and I like it *SO* much! I love the delicacy of it, and I love the subtle textural surprise for the carefully observant. I also like the way it adds a little shadowing in changing lighting conditions. Then I added some bugs. For the chickens to eat, of course! There are ladybugs and little gnats and maybe a caterpillar or two. I thought about adding a snail too. 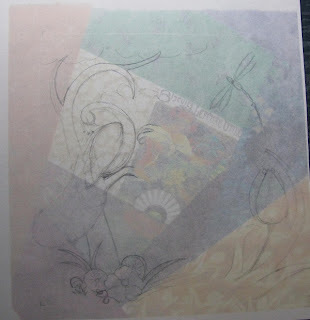 -- maybe I still will if there is time before I send it to the next stitcher. 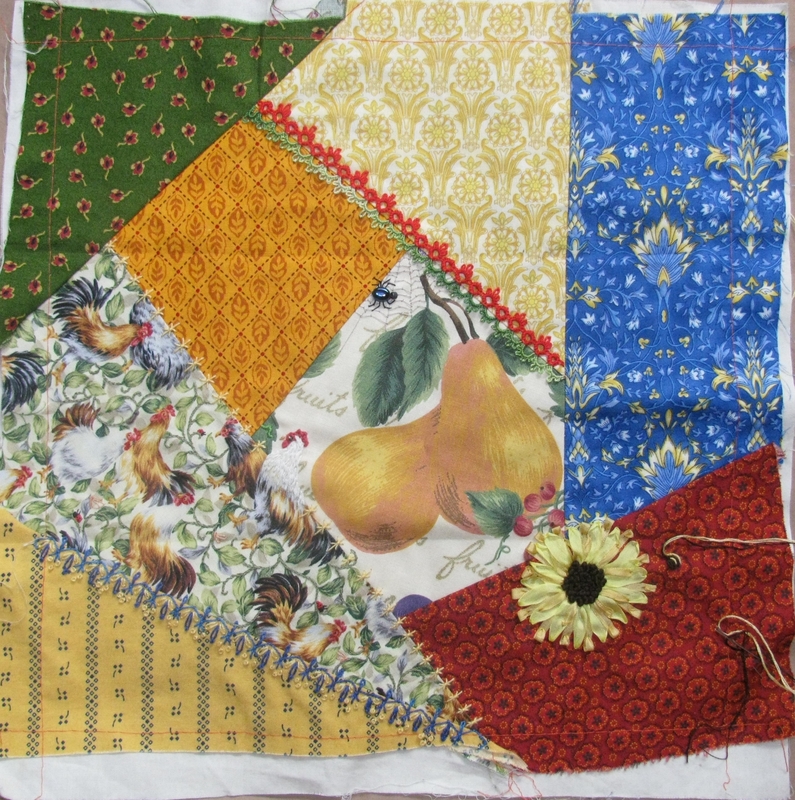 The rooster at the top of the patch, where it seams against the center pear patch, was chopped in half, so I embroidered a head for him, and a little caterpillar for him to snack on. :) I cannot even begin to describe how pleased I am with the way this chicken came out! He's stitched with a nice soft silk thread, too, so he is incredibly pettable! I just hope he doesn't get too dirty from all the touching! 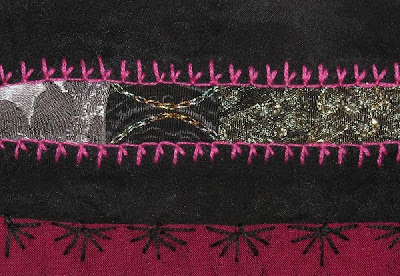 Well, after stitching the bugs in the garden, I wanted to add a little spider and web! I think he turned out pretty nice, though he does steal the eye a bit-- partly because of his size and partly because he is so dark. I think that once the rest of the stitching on this block happens, though, that he will be just strong enough to hold his own. At least I hope so! 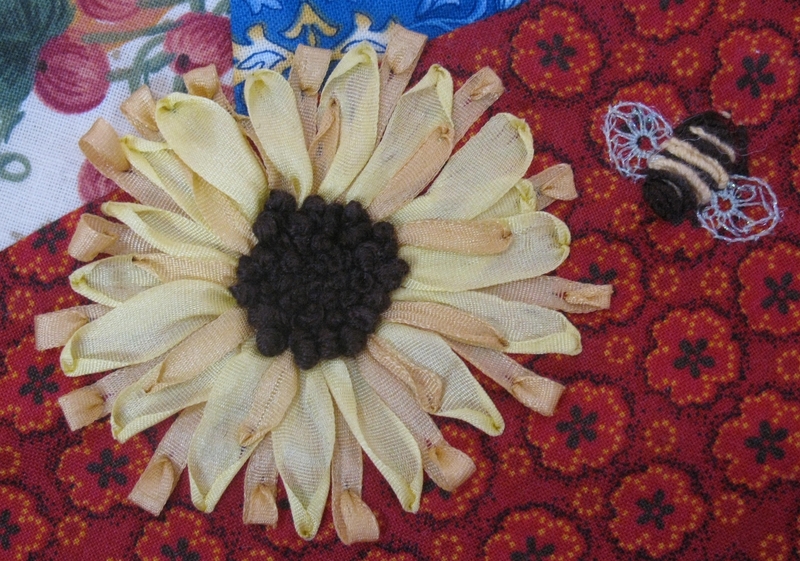 To the right of the sunflower is the start of a bullion stitch bee! once I get that done, I might be ready to send the block on to the next stitcher! ...or maybe I'll get a chance to add that snail. hmm. Well, I didn't get much done on either my "Roses" blocks or my Peacock. I also didn't get my August BJP started. Ack! Instead, I spent my time assembling new blocks. I'd signed up for a CQI new participant's round-robin exchange, and the mail-by date for the block was Sept. 1. Now to get working again on my handstitching! Well, I found the variegated blue-and-purple thread that I used for my buttonhole loops, but not before I gave up looking for it and used a different thread! Ah well, isn't that the way life works? What do you think? does the yellow-and-orange make a good finish to the line? Heh! I'm okay with it, anyway. Another tatted tidbit, this time worked in a braided metallic (gold) and a variegated green perle. The metallic doesn't show real well in the photo. It's pretty glitzy in real life. It's okay.. it just doesn't have the punch that I'd like. Maybe it would be better worked in a different thread, or with different proportions. But it got me thinking about what I'd LIKE for it to look like. Then I played around with varying the construction method, and got these three results, all of which I particularly like! So the DLC itself isn't likely to be one of my go-to stitches, but these three variations I came up with sure are! I'm hoping to get some more stitching done on the purple stripes before the end of the month, but I still have a BJP mandala to stitch up too! ACK!! where does the time go? My favorite shape is the heart, so I have quite a few of those, and I think they're a perfect pairing for the roses. Anyway, aside from encoding the meaning of love and romance, the heart shape also combines angularity with curves, and that is a recurrent theme in itself in these blocks and in my body of work as a whole. By using just a couple shapes recurrently will allow me to use a whole lot more of them without overpowering my blocks. The subtlety of difference between one heart and the next will keep it interesting, and the sameness will give a sense of harmony and repetition. I haven't put up any updates here for awhile. Not offering any excuses, just picking up today and moving forward. 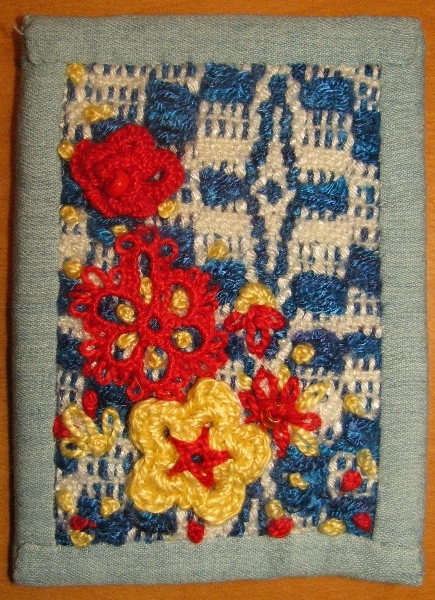 This week my stitching was almost entirely devoted to one of the four CQ blocks I made for Sharon B's online cq class. I call this block "Patchwork" because it is composed of 4 sub-blocks that were created through the foundation piecing method. 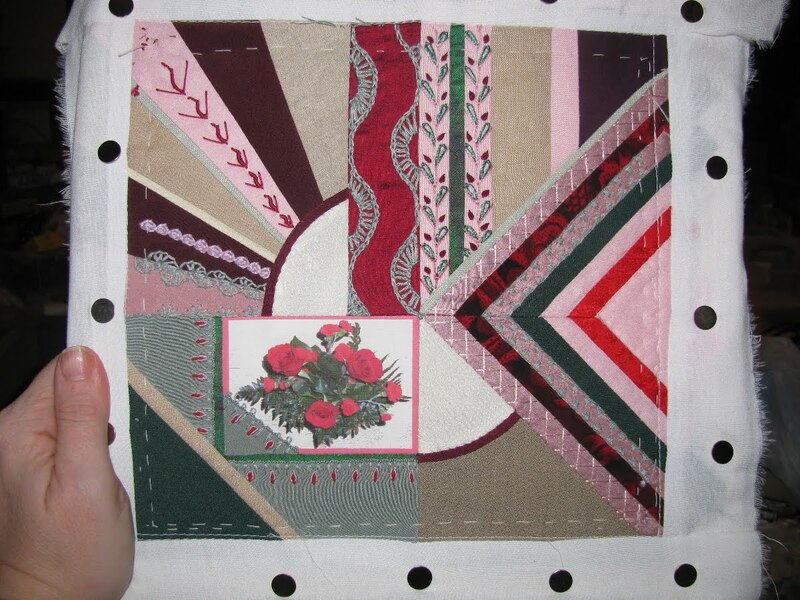 This block is for a larger project I'm calling "Roses" because each block features an image of the valentine roses I got from my husband this year. (I printed the images onto ready-to-print cloth with my inkjet printer.) 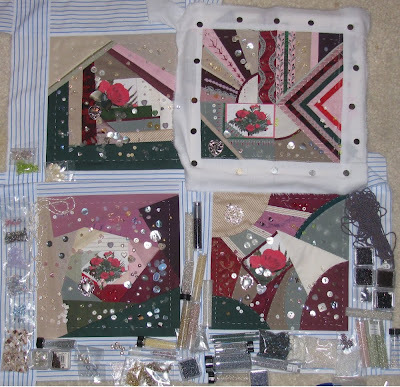 There are 4 8-inch blocks for the Roses wall quilt, and so far I've done embroidery work on just one of them-- on "patchwork". Since the block's construction has so many straight lines and sharp angles, I am using a lot of curves in my embroidery to add counterpoint and to soften the flow of the block. I say my stitching time this week was almost entirely devoted to "Patchwork", but I still managed to find some time to slip in a couple other stitches on a couple other projects. The buttonhole picots are not cast-on stitch, though the effect looks much the same. I worked them a little differently, is all. Cast-ons would work just as well. 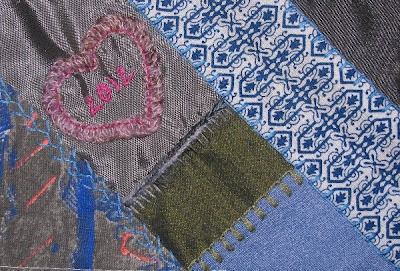 blanket, chain, laced herringbone, up-and-down buttonhole, twisted chain, feather, and herringbone couching a ribbon. 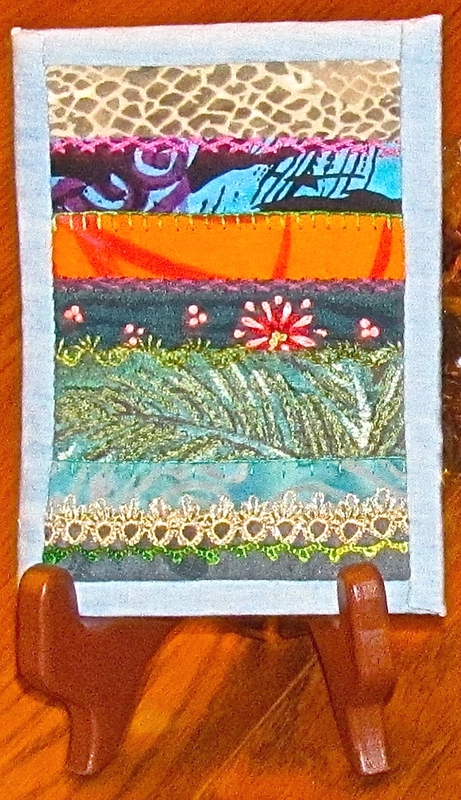 These ATCs and Postcards need to be pretty quick and brainless in order to get them finished and out into the mail, so, with a few exceptions, I tend to use the stitches that I feel most comfortable with-- the ones that I know how to do without looking up a tutorial, or the ones that I just plain enjoy doing. Pekinese made it onto the pc because I needed to do the TAST stitch, and the pc was what I was working on at the time! heh. Up-and-down buttonhole has definitely found its home in my Go-To stitches! Blanket, feather, and chain were already there. Herringbone isn't exactly one of my Go-To stitches, but it shows up pretty often nonetheless. bullion is slow, and it takes up a lot of thread, but I enjoy doing it, so it also claims a spot in my Go-To list. To catch up on my TAST stitching I still need to do some cast-ons, and I'd like to do some better Algerian eyes. ... and then, at some point, I'd like to go back through some of the earlier stitches and refresh my working knowledge of how to do them and what their names were. I think I've forgotten most of them already! ack! !